Porterhouse Pork Chops are brushed with olive oil and za’atar, a Middle Eastern spice blend, then grilled to juicy perfection. You see, I come from a long line of incredible cooks on both sides of my family. Early on, I learned the difference between perfectly cooked meat and dry, lifeless protein. In fact, my mom prides herself on juicy chicken breasts, medium rare steaks and tender pork tenderloin. She always says, “You can continue cooking meat but you can never bring it back to life once you’ve gone too far.” Amen. The best way to avoid grey, overcooked pork is to remove it from the heat once it reaches an internal temperature of 145 degrees. A meat thermometer is your best friend when it comes to properly cooking meat. The Pork Board has created this handy guide on How to Use a Meat Thermometer Properly if you’re unfamiliar. If you’ve shopped for pork recently, you may have noticed that your favorite cuts have had a name change. This graphic is a helpful visual to make it easier the next time you’re in the meat aisle. For this particular recipe, I used Porterhouse Pork Chops. While you can certainly use a different chop, the bone-in cut will help lock in juices and flavor during the cooking process. Za’atar is one of my favorite Middle Eastern spice blends that you can find it major grocery stores, international markets or online. The smoky, toasted flavor of za’atar takes pork to the next level, especially when grilled. What is your favorite way to prepare #pinkpork? If you’re looking for a little more inspiration, The Ohio Hog Farmers are running a fun Pinterest promotion that is sure to get your creative juices flowing. 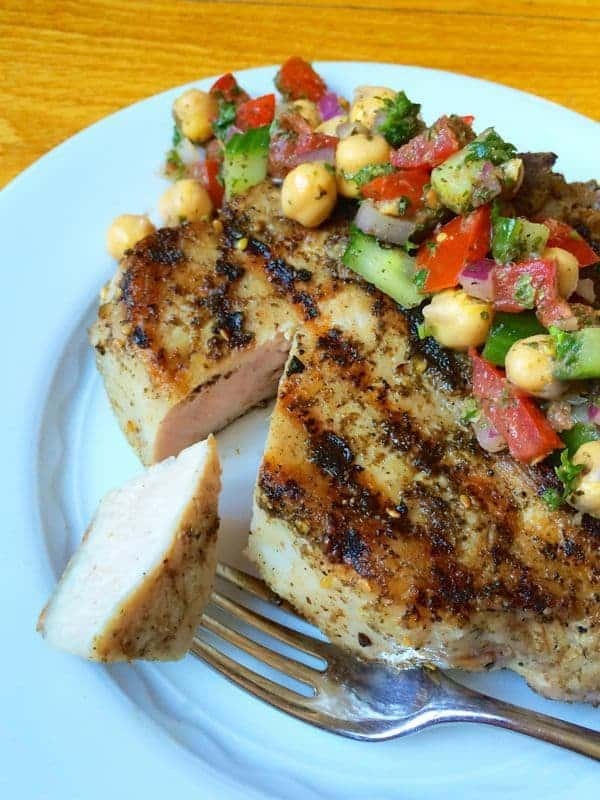 Center cut bone-in pork chops are brushed with olive oil and za'atar, a Middle Eastern spice blend, then grilled to juicy perfection. Pre-heat grill or grill pan over medium-high heat. While grill is pre-heating, let pork chops sit out at room temperature. Brush each side of the pork chops with olive oil then sprinkle with equal amounts of za'atar, kosher salt and pepper. Remove pork from the pan and cover loosely with foil to keep warm. Let rest at least 3 minutes before slicing to ensure juicy pork. Letting pork (or any meat) come to room temperature before cooking is the key to avoid excess shrinkage. If you place cold meat directly on a hot grill or pan it will immediately shrink up. Check out this helpful guide on pork cooking temperatures and cook times based on the type of cut. Disclaimer: The Ohio Pork Council and the Ohio Soybean Council have compensated me for my time to create this recipe. Thank you for supporting the brands that make The Lemon Bowl possible. As always, all thoughts are 100% my own. Yea you make a good point! Ahh Im so glad the timing worked out!! So did the recipe work well for me. 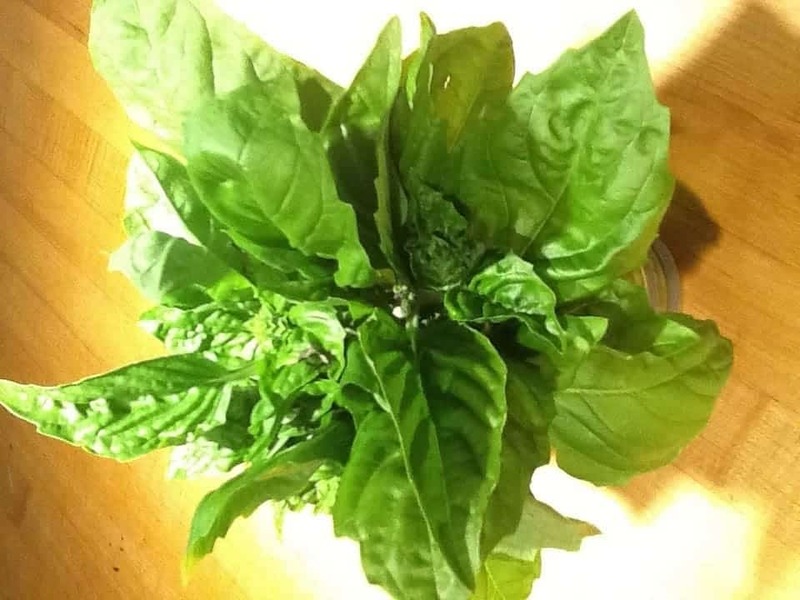 I don’t know if most za’atar has oregano in it – mine does, and the flavor was a bit strong. But za’atar is always a winner. (I’m hoping be able to buy some Israeli za’atar when we get to Israel next year – the stuff I bought in Old Jerusalem 10 years ago lives on in memory.) I ended up serving the pork chops with a side dish I created – poblano peppers stuffed with white sweet potato, goat cheese and chopped cashews – and Mexican squash. Yum! I brought some Za’taar home with me from Israel and haven’t used it on pork yet. This looks delish! Oh let me know what you think! I hope you like it! Great picture! This spice is new to me. I look forward to trying it sometime. Thank you for participating! Once I clear some of the Ohio Beef out of the freezer I think I need to add an Ohio Hog to my meat stash. This looks lovely! Why have I never used za’atar before? This looks wonderful and so juicy! No more dry pork chops for us! You must get your hands on some! So good! That is the second time this week I have run across Za’ater spice. I think the Universe is telling me to get some of it. 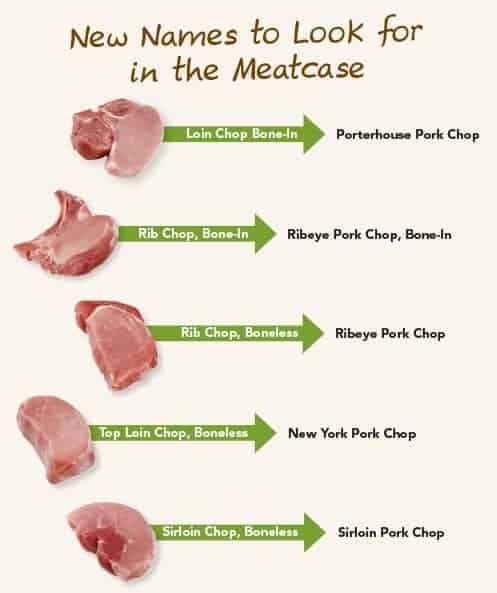 Nice illustrated explanation of the different types of port chops. Thank you. The chops look delicious. 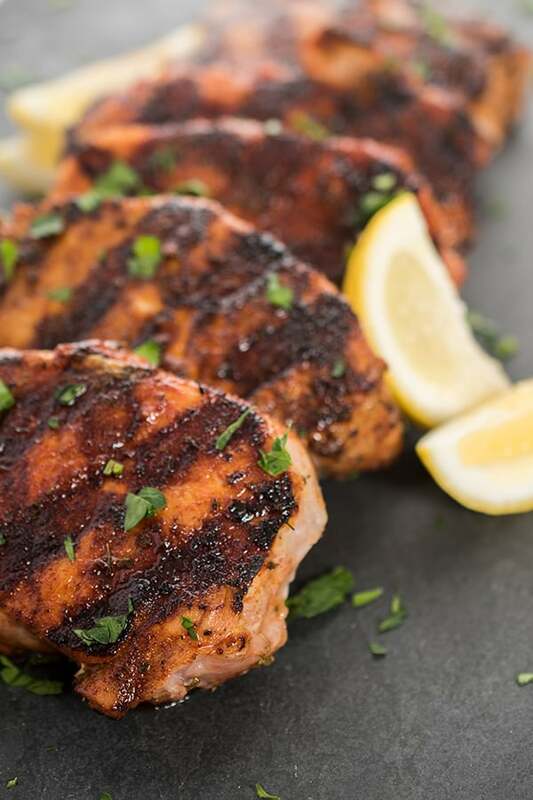 It’s a little hard to fantasize about the flavor since I am unfamiliar with the spice, On the other hand its been a long winter without having any grilled food. Now that got my fantasy reels rolling. Same here!! I actually had to use an indoor grill pan for this recipe due to the snow but I’m ready for spring!! I understand how to cook pork but a friend does not so this is getting sent to her. She will surely thank you!! Question tho…………I think the cuts of pork in my grocers case are a bit different than what you have posted maybe my grocer hasn’t caught up yet. Hmm.. that’s a great question. I’ve seen the new names throughout my stores but perhaps they are being rolled out in stages! Either way let me know if you have any questions! This looks like an incredible dinner! Za atar is one of my favorite spices, it goes well on so many different foods. I couldn’t agree more – I’m a huge fan! I love your creativity and how you introduce us to new techniques. This looks amazing! Thanks so much for being a part of this campaign! Zesty, delicious, I want to make this now. This recipes looks so yummy. Have never used that spices and am looking forward to trying it out. Also, the explanation about the different cuts was helpful. It is sometimes hard to find the porterhouse cut. I usually have to ask for them to cut it as a special order. They told me the reason they don’t normally carry that cut is because so many people want the pork tenderloin. 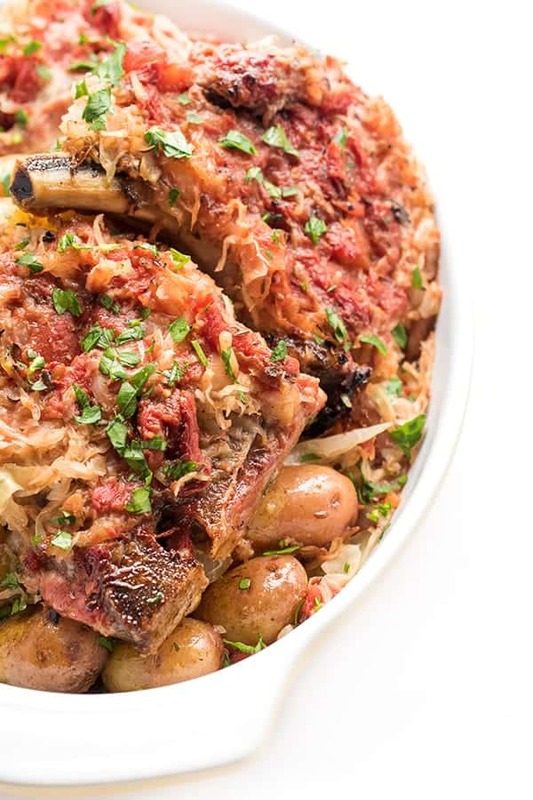 This dish is simply gorgeous, and thanks for the great explanation of the new cuts of pork! Ohhhhh…I cannot wait to try these pork chops. My zaatar has been waiting for just this recipe!! This looks amazing! 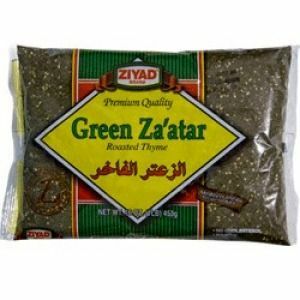 This is probably a stupid question, but does green za’atar still have sumac in it? Looooooove these pork chops, Liz! So yummy!! !